SiSoft benchmarks for leaked for what is thought to be AMD's upcoming Vega GPU, showcasing some impressive performance numbers for the next AMD flagship. This data shows that this new GPU has 8GB of VRAM, using a 2048-bit memory bus, which was expected given the recent die shots of AMD's Vega graphics processor. These results also show that this GPU uses 64 CUs and has a total of 4096 Vega stream processors. While this data clearly has some incorrect specifications, like the listed clock speed of 344MHz, this listing showcases some highly impressive benchmark scores, outperforming may results that we have found for Nvidia's GTX 1080. Sadly compute performance is rarely indicative of gaming performance, especially when comparing vastly different GPU architectures. That being said this new GPU performs admirably when compared to results on AMD's older Fury series GPUs. At this time it is unknown how well AMD's RX Vega series GPUs will compare to Nvidia's GTX 1080 and 1080 Ti series GPUs, though it is clear that AMD is aiming high with this release when it comes to compute performance, making Vega competitive outside od the gaming marketplace. You can join the discussion on AMD's RX Vega SiSoft Sandra benchmark results on the OC3D Forums. I need to check something with the wizkids in here who know all the black magic. According to what we have been told the 8gb's of vram is a minimum, as in thats whats on the card, we can put additional memory to it via the memory controller built into vega, is that about right. Also i was following a discussion about infinity fabric on another forums trying to learn about it and how it actually works, and something that came up there is how ryzen uses it and they were on about how vega may connect to ryzen via infinity fabric. So im wondering if anyone can actually explain how if it is infact going todo that when teamed with a ryzen and what are the benefits of that. In simple terms, Vega is designed to be able to easily access memory outside of their frame buffer, effectively allowing the GPU to use DRAM and even system memory to create a larger frame buffer. In a VRAM overspend scenario, Vega is designed to keep all of the most important info in the GPU's onboard HBM memory, keeping other data in external storage, effectively allowing the GPU to use larger datasets with minimal performance degradation. We speak about this and several other Vega features in out Vega GPU architectural analysis below. Vega essentially has a very smart/innovative solution for using external storage as a frame buffer with a minimal performance loss. This feature is most useful for compute applications, though it will be very useful for games that require lots of VRAM. Imagine a user of an older GPU, perhaps a 3GB or 2GB model, who frequently runs out of VRAM in some modern games but have plenty of GPU performance. This will allow those users to get past certain traditional VRAM limitations, which will be handy for gamers moving forward. Thanks thats very informative, so in essence and ill pick what i think is going tobe a very intensive game being star citizen, very high poly counts and large maps. Vega could be in a position where when your gaming with it vega could throw data that it doesnt need right away like the other side of a galaxy into vram that isnt on the gpu and if you zap to there then vega can flush its vram and pull the data direct to it from outside its card vram to load that faster. From what I could see AMD's drivers are already doing something like that now with the Fury cards on 4gb HBM. It starts out well, until you use your paging file, then it all slows to a crawl. If a game does not need more than the GPUs reported frame buffer of 8GB, nothing will change from traditional memory architectures. In a scenario where a larger frame buffer is needed the VRAM will work as a high-level cache, where all the most frequently accessed data is stored. In many games, the most accessed data is nowhere near as large as the amount of VRAM that is typically filled in a GPU (see image above). If more than 8GB of VRAM is allocated the extra data will be moved to external storage, like DRAM or an M.2 SSD, though Vega will keep all of the most accessed data on the GPU's VRAM. All the additional storage can then directly speak to the GPU, though at this time the exact mechanism, latency penalty or performance loss is unknown. That being said the solution will be faster than traditional methods, which usually slow games to a crawl. 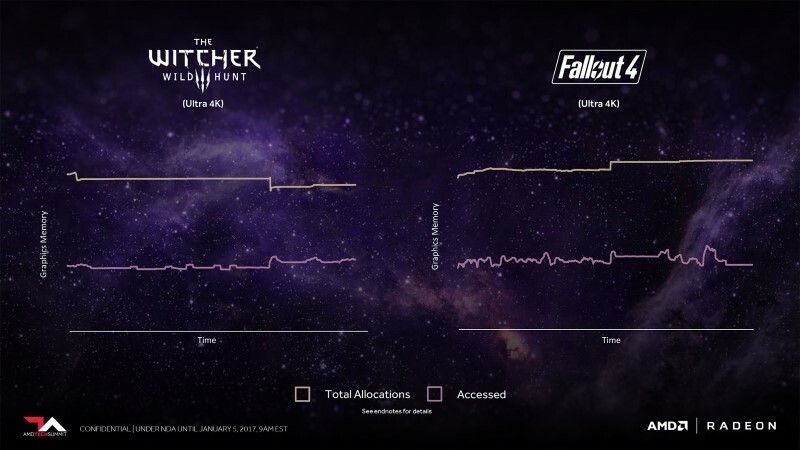 Below is an image that AMD shown to show the performance change in a memory overspend scenario using this technique. Before now, when a GPU is in a VRAM overspend the solution is not anywhere near as smart, not being as selective for what data is kept in VRAM and how external storage is used/interacts with GPUs.